Silver looks so much sweeter when given a gorgeous Victorian style. This gemstone ring from Apples of Gold helps silver shine with a carefully engraved band that features a leaf-like pattern on either side. The silver mounting holds a small heart in between the prongs for a delightful surprise. 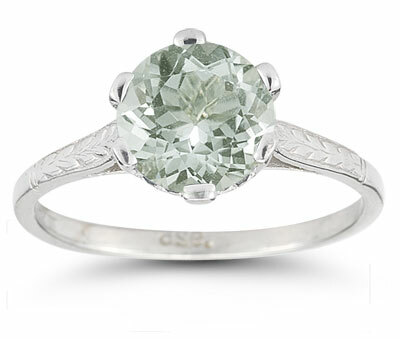 Crowning this piece is a lovely green amethyst gemstone that features a round cut for outstanding brilliance and shine. This Victorian-style gemstone ring is one that you don't want to get away. We guarantee our Sterling Silver Vintage Floral Green Amethyst Ring to be high quality, authentic jewelry, as described above.